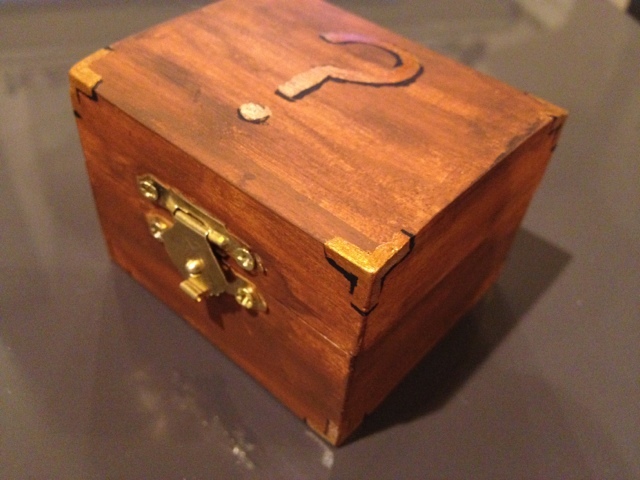 This trinket box wants to give you a quest! Or maybe it holds a reward inside. OR maybe it wants to reward you and then give you another quest! You won't know until you open it up! I hand-painted this little box using two shades of brown acrylic paint (to simulate a wood stain while giving me better control over shading), and then added details using a high-quality gold paint and black to create shadows. The gold corners gives it that campaign-style touch like tiny metal brackets. I thought about making the question mark yellow, but I liked the gold so much I decided to stick with it instead of adding another color.